Make sure to water the outside of the container and the plants inside once a week. Place a small cup of water in the ladybug house for the ladybugs to drink. 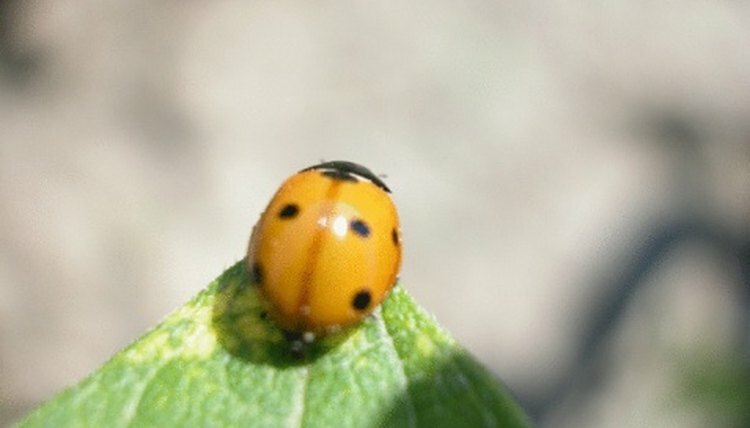 Ladybugs are beneficial insects that feed on garden pests such as aphids, mites, insect larvae and other pests that harm plants or garden vegetables. Ladybugs are a garden’s best friend. You can encourage ladybugs to stay in your garden by making a ladybug house. A ladybug house will help keep the ladybugs safe and protect their eggs during the cold winter months. You can make a beautiful living ladybug house that will blend and grow with your garden plants using chia (Salvia Columbariae) seeds. Cut six or more 2-inch holes all around a tall, large, round cardboard container. The holes will be the windows of the ladybug house. Make sure the container has a lid. Use a sharp cutter or craft knife to cut the holes. Cover the entire cardboard container. including the lid, with a thin layer of pottery clay. Make sure the lid is not on top of the container when you apply the clay to prevent them from sticking together. Make many grooves all around the container. The grooves will help keep the chia sprouts in place. Set them aside and let them harden for a few hours. Shred 10 to 12 pieces of colored paper of your choice and put them in a blender or food processor. Add one cup of water and one cup of chia, or Salvia Columbariae seeds. Puree the mixture for about five to 10 seconds. Chia seeds are used in the popular figurine product called a Chia Pet, which sprouts chia. You can purchase chia seeds at your local plant store or order them online. Spread the chia seed mixture all over the cardboard container, including the lid. Make sure to push the mixture into the grooves with your fingers. Set it aside, and let it dry for 24 hours. Poke holes under the container using an awl. The holes will serve as drainage. Add a layer of dirt and grass in the container. Scoop up a layer of dirt and grass from your backyard or purchase a grass growing kit, which you can find at any plant store. You can also add small plants if you don’t like grass. Place a ladybug lure inside the ladybug house. This will help attract the ladybugs. You can purchase ladybug lures at a home and garden store or online. Put the ladybug house next to some flowers in your garden. You will see the chia sprouts start growing after a week. Make sure to water the living container once a week.